The oversize bolt handle, bolt release and loading port are easy to operate with gloved hands, and the magazine capacity is<br /> 4 + 1. Trigger pulls were crisp and averaged 5½ pounds. The safety is located on the guard behind the trigger. The stock was A-Grade Satin Walnut and capped with a rubber TSA recoil pad. Measurements were: length of pull, 143⁄8″; drop at comb, 1½”; drop at heel, adjustable from 2″ to 2½” with the included four-shim kit (which also allows for cast adjustments); and slight cast-off. Checkering on the forend and pistol grip offered a secure hold. The stock is also available in AA-Grade Satin Walnut, black synthetic, Realtree Max-5 and Mossy Oak Bottomland. The chrome-lined 28″ barrel (also available with 26″) has a 3″ chamber, stepped vent rib and fiber-optic red-bar front sight. Flush-mounted choke tubes are notched at the ends, so you can tell which is in the barrel. Our gun came with Full, Modified and Improved Cylinder (the M and IC being approved for steel shot) plus a wrench. For long walks in the field or out to the blind (especially when you’re lugging other gear), there’s nothing like a lightweight semi-auto. And when that covey of birds finally flushes or that flock of ducks sets in, the luxury of an extra shot or two is often welcome. 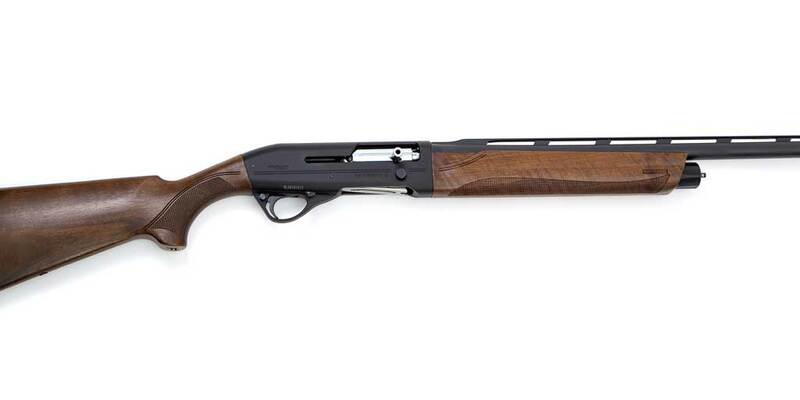 The Franchi Affinity 3 is a sleek, well-balanced autoloader that operates on the reliable Inertia Driven system like its Benelli brethren. The 12-gauge we tested would be perfect for all-day carry and look sharp in the gun rack back at the lodge. We tested the Affinity 3 at the range and found it to be a quick-pointing, light-kicking, clay-breaker. It had no problem cycling heavy target loads (2¾”, 3 drams, 11⁄8 oz of No. 7½s) and heavy game loads (2¾”, 3¼ drams, 11⁄8 oz of No. 6s) but balked at low-recoil, low-noise target loads (2¾”, 2½ drams, 1 oz of No. 8s). In all fairness Franchi recommends a minimum load of 3 drams, 11⁄8 oz. With appropriate fodder, the gun cycled quickly and ejected shells with authority. Even with a weight of only 6 pounds 7.7 oz (on our postal scale), the gun was not abusive on the shoulder and surely would have been even more comfortable with the distraction of game. Price: $899 ($789 for black synthetic), with a 7-year warranty. For more information, contact Franchi USA.